The Dallas Cowboys are coming off a relatively surprising 2018 campaign that saw the team earn the NFC East title and a trip to the divisional playoffs. Said success was limited by some pretty bad in-game coaching against the Los Angeles Rams in the postseason. It ultimately cost struggling offensive coordinator and play-caller Scott Linehan his job. 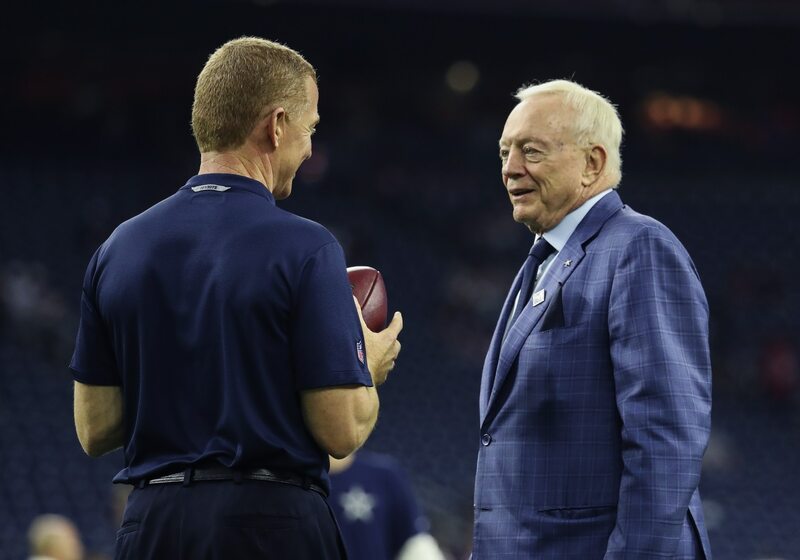 While it appears that head coach Jason Garret’s job is safe, recent quotes from Cowboys owner Jerry Jones muddies the water a bit. Take this dandy as an example. Given that Garrett was not the Cowboys’ play caller this past season, anything less would limit him to an Oz-like figure behind the scenes — a coach that does nothing to help his team from an in-game perspective. This comes after Jones offered up yet another interesting quote following Dallas’ loss to Los Angeles. Speculation arose that Jones could’ve been talking about longtime Saints head coach and former Cowboys assistant Sean Payton. Remember, Jones has attempted to pry Payton away from the Saints numerous times over the years. These quotes really got us thinking. Has Jones even committed to Garrett for the 2019 season? Here’s an in-depth look at the situation in Big D.
Changes are definitely in store: Look for 30-year-old assistant and quarterbacks coach Kellen Moore to take over as offensive coordinator. This former Boise State standout has been fast tracked big time since retiring from the NFL. If Garrett were to stay on as head coach, Moore would likely take over as offensive coordinator. Whether this means Moore would be the Cowboys’ play caller remains to be seen. Hence, Jones’ odd comments about Garrett’s involvement in the Cowboys’ offense. With no play-calling experience at any level, promoting Moore would be somewhat of a risk for Dallas. Assistants in New England and Los Angeles come into play: Jones noted that opportunities are available to the Cowboys as the playoffs moved forward. Rams quarterbacks coach Zac Taylor is on the verge of being hired by the Cincinnati Bengals as their new head coach. This doesn’t mean that there aren’t other options on Sean McVay’s staff. Run-game coordinator Aaron Kromer could be an OC possibility for Dallas. Kromer served as the Saints’ interim head coach back in 2012 when Payton was suspended. He has experience calling plays with the Bears and above-mentioned Saints. Patriots wide receiver coach Chad O’Shea could also be a possibility. He’s drawn quiet interest as an OC in recent seasons and has served in this role with New England for the past 10 seasons. The big fish: Of course, Jones’ comments could lead directly to Sean Payton. There’s still no telling if New Orleans would let Payton out of his contract. Rampant speculation over the past few years have suggested that he might not be long in the Bayou. Payton served as the assistant head coach and quarterbacks coach for Dallas from 2003-05. Instead of promoting him to head coach, Dallas decided on retaining Bill Parcells and ultimately hiring Wade Phillips. This is still a sore subject for Jones. He’d obviously like to be given a mulligan as it relates to those decisions. If the Saints don’t let Payton out of his contract, there’s also a remote possibility that the two teams could work out a trade. There’s been widespread speculation that Jones prefers Garrett over others because he can control the head coach. It’s in this that Garrett has been seen as the owner’s lap puppy. But if an opportunity like Payton were to present itself, there’s absolutely no telling whether Jones would call an audible. He’s a true wild card here.